Sirius, the "Sparkling One" or the "Scorching One," also called the "Dog Star" and the "Nile Star," is the brightest of the fixed stars, the leader of the hosts of the heaven. Located in the constellation Canis Major, Sirius is 9 times more brilliant than a standard first magnitude star. The most accurate modern observations measure its magnitude as –1.42. The star is a brilliant white with a definite tinge of blue in color, yet in its rapid scintillation it often seems to flicker with all the colors of the rainbow. Sirius is about 23 times as bright as our sun, 2.35 times its mass and 1.8 times our sun's diameter (our sun is about 1 million miles wide). The surface temperature is about 10,000 degrees Kelvin, and the central temperature is computed to be over 20 million degrees. In the last 2000 years, Sirius has changed its position about 1-1/2 times the apparent width of our moon. Only 8.7 light years from the Earth, Sirius is the fifth nearest star to us. Except for Alpha Centauri, it is the closest of all the stars we can see with our naked eye. The vastness of space is dramatically illustrated by the fact that even such a nearby star is 550,000 times more distant than our sun. Sirius is a member of a moving group of stars often called the Ursa Major stream, with members scattered all over the sky. The most prominent members of this stream are Alpha Ophiuchi, Beta Aurigae, Delta Leonis, and Alpha Corona Borealis ~ and Sirius. The name of the star Sirius comes from the Greek meaning "searing" or "scorching," highly appropriate for something so brilliant. In Greek times its rising at dawn just before the Sun marked the start of the hottest part of the summer, a time that is now known as the Dog Days. "It barks forth flame and doubles the burning heat of the Sun," said Manilius, expressing a belief that the star had a heating effect. The ancient Greek writer Hesiod wrote of "heads and limbs drained dry by Sirius," and Virgil said, "the torrid Dog Star cracks the fields." "Hardly is it inferior to the Sun, save that its abode is far away," wrote Manilas, anticipating the modern view that stars are bodies like the Sun only vastly more distant. Yet in regard to the supposed heating effects of Sirius, Manilas continued: "The beams it launches from its sky-blue face are cold." As we have discovered Manilas was nearly correct! Sirius is a blue-white star, even larger and brighter than our sun, and one of its closest neighbors. During the years between 1834 and 1844, astronomer F. Bessel found that Sirius had wavy irregularities in its motion through space, and came to the conclusion that the star had an invisible companion revolving about it in a period of about 50 years. The proper motion of Sirius A (path of large dots), showing how the irregular curved path is caused by the attraction of the massive companion, Sirius B. The center of gravity moves along the middle solid line in the direction of the arrow. In January 1862, Alvin G. Clark fulfilled this prediction by discovering a companion to Sirius A, the "white dwarf" star Sirius B or "the pup." This companion to Sirius has been an object of greatest interest since its discovery. Its mass is nearly equal to that of our sun, while its diameter is 19,000 miles wide ~ 40 to 50 times smaller than our sun's ~ and an incredible density of about 90,000 times that of our sun. A cubic inch of Sirius B's material weighs about 2-1/2 tons. Its temperature is approximately 8500 degrees Kelvin, several thousand degrees hotter than our sun, and not much cooler than Sirius itself. Its luminosity is 1/400 that of our sun, and it is 10,000 times fainter than Sirius A. With a magnitude of 8.65, Sirius B is still the brightest of all the white dwarfs and remains the most famous member of this strange and wonderful class of stars. As we have seen, Manilas was nearly correct! Sirius is a blue-white star, even larger and brighter than the Sun. It lies 8.7 light years away (this means it takes 8.7 years for the light which is emitted from Sirius actually to be visible to us on Earth), making it one of the Sun's closest neighbors. 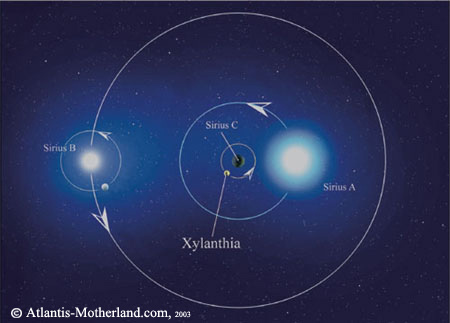 Sirius A and Sirius B form what has been known as a binary star system. 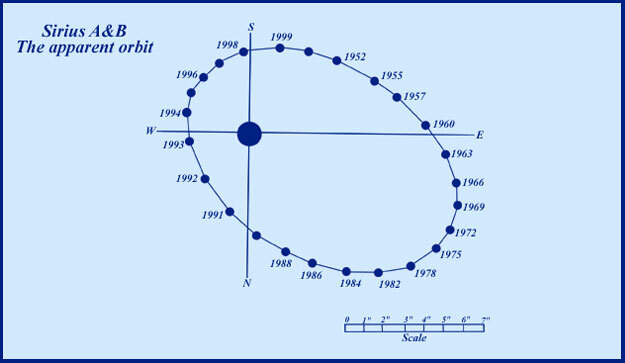 They have a very eccentric orbit around each other, every 49.98 years. Although Sirius B is totally invisible to our naked eye, its effect on the electromagnetic fields of our Milky Way galaxy, solar system, planets, and the Earth itself are tremendous. Due to the magnetic properties and incredible density of Sirius B when it comes closest to Sirius A, this creates huge magnetic storms which cause the stars to exchange large amounts of highly charged particles that are injected into the galactic magnetic field of the Milky Way. This magnetic field has been documented by science to exist between Canis Major, Sirius and Aquila, the Eagle. Our earth lies in the stream of energy from Sirius, so that during these 50-year periods we're bombarded by highly charged particles affecting electromagnetic fields in a cyclic manner. The magnetic storms on Sirius apparently increase in intensity beginning approximately 5 years prior to the closest approach of Sirius A and B, and are felt up to 5 years after. This closest alignment of Sirius A to Sirius B last occurred in 1993 and 1994. 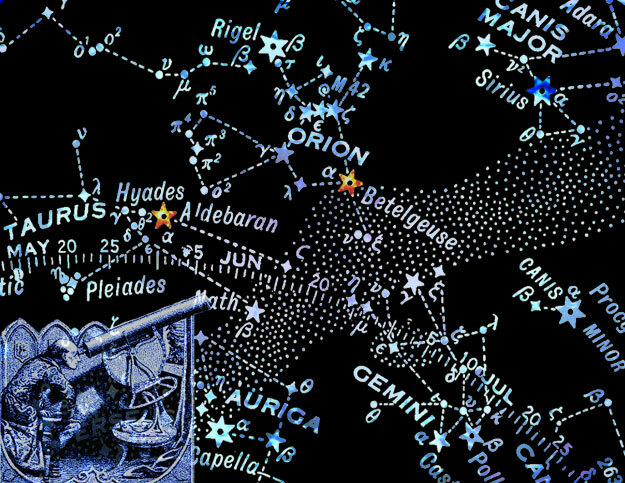 Every year on July 4, from our earth's position, our sun conjuncts the star Sirius. Sirius is associated with liberation. According to ancient teachings, the very concept of freedom itself resides in human consciousness because of the influence of this star system. Interestingly enough, our sun conjuncts Sirius, at 14 degrees Cancer, at the Fourth of July, America's Independence Day! And Bastille Day, the French Independence Day, is July 14. As the most recent "great conjunction" of Sirius A and B occurred around 1993, a wave of freedom was sweeping our world that culminated in the breakdown of the communist rule in Europe and the liberation of the Russian people from the hard-line Communist party. The Berlin Wall fell as the cold war finally ended ... these events transpired simultaneously with the magnetic forces building to their highest intensity on Sirius. Is there a connection? Perhaps.